The announcement comes amid a stepped-up campaign from activist groups urging an end to the membership standards. The Boy Scouts convened a committee of 11 senior volunteers and professional leaders to decide whether the policy was still in the organization’s best interests after a resolution was put forward to reconsider it, the private group said in a statement that was first reported by The Associated Press. The nearly two-year-long review began in 2010. The committee reached a "unanimous consensus" that it was the "best policy" for the BSA, Scouts' spokesman Deron Smith said in an email. That conclusion was shared at a February board meeting and recently reviewed by the officers of the board, he said. “The committee included a diversity of perspectives and opinions. The review included forthright and candid conversation and extensive research and evaluations -- both from within Scouting and from outside the organization. The committee’s work and conclusion is that this policy reflects the beliefs and perspectives of the BSA’s members, thereby allowing Scouting to remain focused on its mission and the work it is doing to serve more youth,” the statement said. The review was conducted confidentially "to allow the committee to make the best decision for the organization," Smith said. In June, the Boy Scouts said the organization was considering another resolution proposed at the group's annual meeting the month before that also called for ending the policy. But the decision announced Tuesday means the Scouts’ board will take no further action on that resolution, Smith said. "Resolutions can always be submitted as defined by our bylaws, but the officers of the board have no plans to further review this issue," he said. The Boy Scouts’ policy became a focus of the U.S. Supreme Court in 2000, when the justices sided with the organization in a lawsuit involving a former assistant Scoutmaster who was gay, citing the protections of the First Amendment. Tyrrell, a 32-year-old stay at home mother of four, said she agreed to become the den master on the day she signed up her son, Cruz Burns, for the local troop, last year. She had concerns about the Boy Scouts' policy against homosexuals, but a Cubmaster said that – locally -- they wouldn't have problem. Zach Wahls, an Eagle Scout who is the son of a lesbian couple, has recently campaigned for changing the policy, along with Jennifer Tyrrell, who was ousted from her post as a Tiger Cubs’ den leader in April because she is a lesbian. 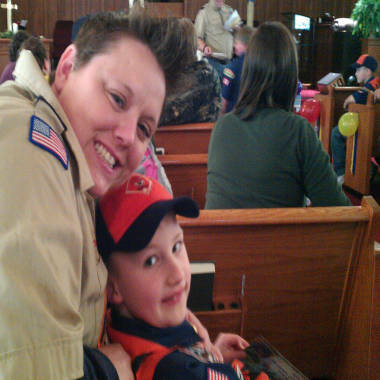 She started an online petition to seek changes to the Boy Scouts policy. Smith said the Boy Scouts would accept Tyrrell's petition on Wednesday, but did not plan to discuss the policy. Another big batch of petition signatures was delivered by Wahls to the Boy Scouts' annual meeting in May. Wahls denounced what he said was "the secretive nature surrounding how this conclusion was reached" and called the announcement "old news." "We've heard this line before, and we'll hear it again before this is all said and done. I've said this before and I'll say it again: this will be the official BSA policy up until the day it finally ends," he said in an email to msnbc.com. "Regardless of your thoughts on homosexuality, surely we can agree that gay people who serve our troops and communities deserve our respect and gratitude." BSA board member James Turley, global chairman and CEO of consulting and tax firm Ernst & Young, said in mid-June that he was working within the organization to encourage dialogue on the policy, which is not one he would “personally endorse.” When contacted Tuesday, his firm's media representatives said he would have no comment beyond his earlier remarks.